I just show part of their lives and leave the remainder to the imagination of the audience. I like to see viewers get involved in the story of my photos, not just their beauties. None of my photos has a strange surreal atmosphere. They feature the familiar scenes we pass by each day, but we now pause to watch the photos and they make us think. “When I shot these images, it was a dark time in Iran’s history,” says Newsha Tavakolian. “It was a time of extreme pressure on the public, especially on the youth, who were all struggling under the imposed restrictions.” Curious about the isolated lives of the middle-class youth in Tehran, Tavakolian staged images based on the real stories of her friends and neighbours to depict a society that the photographer believes is often reduced to exaggerated stereotypes in western media, and to give a more accurate portrayal of “normal people” in Iran. As a photojournalist, you not only covered the news on Iran but also news stories in the region, including the Iran-Iraq war. How was it like? Back then I was 21. In Iraq I was accompanied by two American women. When we left Iraq after the war, they had other projects to work on and show themselves, but I came across closure of newspapers [in Iran] and a stagnant situation in which you would be consumed by inaction. I refocused my efforts on upgrading my works. You cannot believe how terrible I was in photography and how much I worked on it. I’m the harshest critic of myself. I relentlessly review my works in order not to let others find any faults with them; I don’t let anybody undermine my self-confidence either. I constantly evaluate and challenge my works, and I think this is a forwarding method. Where do you think the world is heading with too many photos available? Today mobiles and tablets don’t miss even one single moment. …. I don’t walk down this path. I don’t produce a big volume of photos. I’m stingy in photography. I feel responsible for taking any photo. I’m stingy even in sending the feed to my eyes and mind. I wouldn’t look at just any video or photo because I wanted to train my eyes. As a professional photographer, is your life affected by news? Is news still tragic for you? Pieces of bad news send chills down my spine. I’m still involved in photojournalism. It is a labor of love. Let me give you an example. After a tough period of hard work – a four-month trip to 13 countries for filming and photography for an educational project – and facing problems with the Carmignac Foundation, I was in the Netherlands where I decided to go to the beach and have a rest. It coincided with the crash of a Malaysian airliner in Ukraine. The families of the Dutch nationals who were onboard the [doomed] plane went to the airport to ask about their loved ones. I rushed to the airport when I heard the news. I was unaware that I had no camera, so I collected one at the airport and started to take photos. Nobody was waiting for my photos. About one month ago I went to Iraq for a personal project. I didn’t snap the most important photo I could take and wrote it instead*. You’ve travelled to many countries. Have you ever thought about migration given that your husband is not Iranian? I’m still in Iran because it is the only place where I can use all my senses: anger, happiness, concerns, etc. My Iran photos are the strongest. It’s hard for me to let go of what I’ve developed an interest in. Luckily my husband is interested in Iran too. Tell us about what you’ve changed in yourself through your own constructive criticism. Whenever I hold a camera, I imagine it’s my first time. […] Each day I try to gain new things. It all started when I returned from Iraq. I could either suffer from postwar depression or forget whatever I had experienced in order to return to normal life. I chose the intentional forgetfulness in order not to be entrapped by sentimentalism, and not to regret the past. Never do I think about the past. I face the future. Each time I reach the end, I start from scratch. 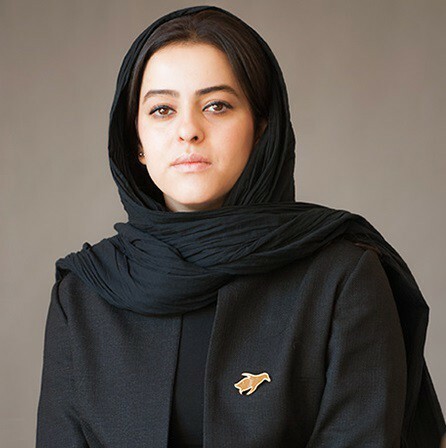 This entry was posted in People & Society, Women and tagged Art, Newsha Tavakolian, People, Photos, Tehran, women on February 2, 2015 by socialinform.